I have done a lot of experimentation in my life with all sorts of herbs and cleanses. I have done 3 water fasts: one lasted 21 days, one 16 days and another 12 days. I’ve done juice “feasts” or fasts. My longest lasted 60 days. I’ve done herbs and cleanses with apple cider vinegar, honey and psyllium husks. Because the body is self-cleansing on a regular basis. We breathe out carbon dioxide when we exhale. We urinate wastes and eliminate waste through our skin and feces. The body, when given the proper conditions, cleanses itself we just get in the way. All of these so-called cleanses are palliative measures to a self-destructive lifestyle which, if changed, would be unnecessary. The cleanses are a “punishment”; a sort of “penance” for “sinning” with our food and drink and wrong living. Correct the wrong living and the cleanse becomes unnecessary. 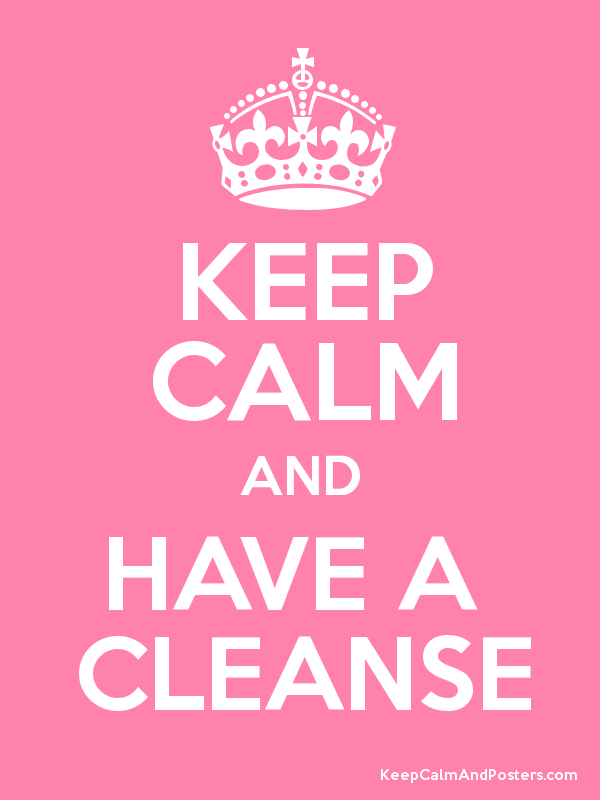 In fact, cleanses can do harm in that they give the cleanser the wrong idea that it’s okay to go back to their wrong mode of living because they can just “cleanse” again. And, some cleanses like water fasting, can be harmful in some conditions and expensive. So what aids the body in doing it’s own self-cleansing? The first thing is getting enough sleep and rest. The body then is able to redirect all the energy it normally is expending towards physical activity and mental activity towards cleaning house and repairing damage. When we under sleep and over work, the energy in our body runs slow and we fall behind on this cleansing because the body doesn’t have sufficient energy to do the job. You see it in the morning in water retention, dark under-eye circles and bags. At last the garbage reached so highThat it finally touched the sky. We also aid in cleansing by getting daily aerobic exercise. This activates our lymphatic system, our “garbage collector” system in our body. The lymphatic system relies on muscle contractions to move through the body since it is not connected with the heart circulatory system and thus we need deep breathing, which itself is cleansing, and muscle contraction and up-and-down movements to get the lymph flowing. Some things that clog the lymphatic system are fats and animal proteins and salt. All of these foods cause the body to back up in it’s cleansing efforts as they are all toxic. So eliminating those items REGULARLY will cause you to not have to “cleanse” them from your system. Sure, your body may need to catch up from the years of eating those foods, but once it does, it does not need further cleanses. And, you don’t need a “cleanse” to get those residues out: you simply eat a low-fat, plant-based diet, devoid of salt on a regular basis, get daily exercise and plenty of sleep and the BODY does the rest. 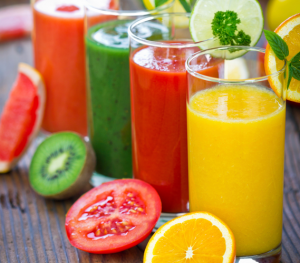 Juicing is something that can be done regularly as an adjunct to a plant-based diet, but fiber is one of the most cleansing substances we can ingest. The soluble fibers literally bind with cholesterol in our arteries, so we don’t want to eliminate fiber on a regular basis. Water fasting does help aid in weight loss and cleansing efforts, but poses risks in creating deficiencies which will actually hinder the detoxification process as the body needs certain nutrients and proteins to create enzymes which break down toxic substances to be eliminated from the body and if we are deficient in those, it can’t do its cleansing process sufficiently. The best way to keep a clean and well-functioning body is to eat well on a daily basis, rest enough on a daily basis and exercise on a daily basis. There’s no getting around it. No need for any exotic or expensive cleanses or fasts. Just exercise consistently and discipline in yourself in your daily habits and your body knows how to do the rest. Of all the “cleanses” I have tried, what has worked the best for me is eating a raw, low-fat vegan diet with no salt on a daily basis, running an hour a day and getting at least eight hours of sleep a night as well as managing stress. I never go hungry, I am fit and lean and there are no “ups” and “downs” in my lifestyle. 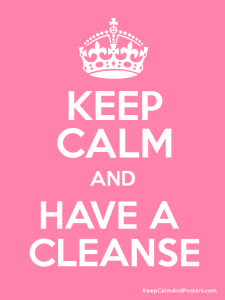 Instead of “keep calm and have a cleanse” it should be “keep calm and live well”. Save your money and trust your body to do its job when you cooperate with its efforts to keep you in a pristine, healthy state.